She was referring to communications and documents related to the deadly attack last September on the U.S. diplomatic mission in Benghazi, Libya, and Justice Department opinions on counterterror strikes against U.S. citizens abroad. The intelligence panel is expected to eventually back Brennan for the top spy job, but the nomination could face another delay once it reaches the full Senate. As President Barack Obama's chief counterterrorism adviser, Brennan was behind the dramatic use of armed drones to kill suspected terrorists, including American-born cleric Ansar al-Awlaki. He was killed by a missile strike in Yemen in 2011. Members of Congress had repeatedly asked the Obama administration to provide relevant committees its legal opinions on targeted killings of Americans fighting on behalf of militant groups. The White House turned over two opinions from the Office of Legal Counsel last week, but Feinstein said it was not complete since there are additional documents. "We have reiterated our request for all nine OLC opinions, and any relevant documents, in order to fully evaluate the executive branch's legal reasoning and to broaden access to the opinions to appropriate members of the committee's staff," Feinstein said in a statement on Wednesday. At his confirmation hearing, Brennan defended the use of drone strikes but acknowledged there should be more public discussion about them. Feinstein hopes to schedule a committee vote soon after lawmakers return from a two-week recess that begins on Friday. But there could be further delay regarding a confirmation vote by the full Senate. Sen. Rand Paul, R-Kentucky said he is prepared to put a hold on the nomination - effectively preventing a vote - if he does not get answers to his questions about targeted killings. "I have asked Mr. Brennan if he believed that the president has the power to authorize lethal force, such as a drone strike, against a U.S. citizen on U.S. soil, and my question remains unanswered," Paul said. The White House declined to comment on whether Brennan would provide a response to Paul or whether it would turn over more legal opinions to the Senate. Typical GOP obstructionisim continues. Anything Obama wants, even if it makes perfect sense, is a "No". .I cannot wait until '14 to vote ALL Republicans out of office!! Extrajudicial drone strikes make perfect sense? Typically liberal dementia. There isn't Republican in the house or Senate that lives in the real world. I don't know if Hagel or Brennan are the right choices, but blocking their nominations makes American look weak and indecisive to our allies and enemies alike. It jeopardizes our national security. The Republicans seem willing to flush this entire country down the toilet just to exacerbate their vendetta against Obama. Whether you are right or left, that looks like treason to me. While I disagree with the status of Hagel's nomination, I fully support Brennan's nomination being held up. It's about time that attention was brought to Obama and his precious drones. This administration has enjoyed secrecy and scant media coverage on their illegal drone policies for quite some time. Brennan's nomination should be held up until questions are answered. The "legality" that Obama claims on murdering Americans has not been substantiated and the question of if the government can assassinate Americans on American soil has not been answered either. Keep in mind that whatever policies saint Obama puts in place will be carried over to the next president. NO American should be dumb enough to be comfortable with one man having the power to execute them without showing any evidence or having to prove that you warranted being killed. Obama is tyranny in the guise of security and the people being vilified are trying to inject some sense and civility into these secret and illegal dealings. Where was the inquisitive need to know the absolute truth immediately when Bush put his fake evidence before Congress linking Iraq to 9/11? I remember the few (Democrats) who dared to ask for more details and supporting evidence were immediately labeled by the GOP, Fox News, Rush Limbaugh, etc. as "terrorist sympathizers" and were accused of "giving comfort and aid to the enemy". Now suddenly the GOP "cares" about the lives of embassy workers and who killed them (an angry mob or people who've been trying to kill them every day for the last decade- what does it matter?). But of course none of them cared enough to approve their increased security budget. Instead the penny-pinchers (when it comes to American lives) voted to slash their budget (I guess so they could give even bigger subsidies to the oil companies who are making record profits). Maybe the embassy should have bought all its equipment from Hallibutron. Then we know the GOP would have written a blank check for anything they wanted. What if Obama wanted to select Ronald Reagan as the greatest American ever, would the crazy Repubs fight that also??? Well, if its your wish to go execute GWB and republicans for war crimes and treason, its your call. And while you're at it, don't forget to give a sip of Kool-Aid to yourself and to the rest of your conservative friends who voted for the party of treason and war crimes. And purposfully jeopardizing national security by blocking cabinet nominations just because of an insane, demented vendetta against Obama is not treason? And we all have questions about your intelligence. Your entire statement is so far off base, you must be writing a fantasy right-wing fiction novel. Yawn. That's just a binder of water-gate and belogna. We don't have to use drones to target U.S. citizens involved in domestic terrorism on U.S. soil simply because that is the job of the FBI. Furthermore, if Mr. Paul is concerned about domestic terrorists being brought to justice, perhaps he has forgotten that during the Cold War, U.S. citizens were executed on U.S. soil for corroborating with the enemy and selling classified information. Rand Paul said he's prepared to hold up the nomination of Mr. Brennan if he does not get answers about targeted killing. 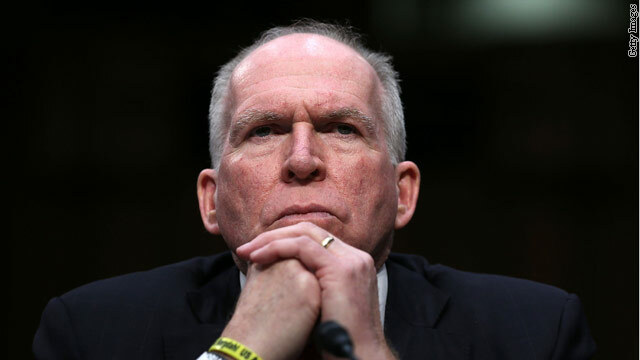 Then he further stated that he has asked Mr. Brennan if the President has the power to authorize lethal force such as a drone strike against a U.S. citizen on U.S. soil. Hehe. Let me see, Rand Paul and his family are enjoying Secret Service protection so that U.S. citizens on U.S. soil don't assassinate he and his family. There, I answered your question for Mr. Brennan. Idiot. Correction: There's your answer Mr. Paul. Right wing idiot. that's because there's a viral email that says that top officials are being asked if they will fire on American citizens. People who are US citizens by birth de facto renounce their citizenship when they become enemy combatants who betray their country ahd declare war on it. Therefore they ought to be treated as enemy combatants whether they are on US soil or not. That goes for the American Bin Laden, Taliban Johnny, and all other such traitors, Mr. Rand Paul, tea party idiot. So you're ok with the President having the power to kill American citizens on American soil with out due process. I suppose you would have been ok with Bush having that power too, Right? Got it. Anything, just anything, Congress will do to keep our country from moving forward! The peoples' biggest enemy is no longer outside the US, they sit in the House and Senate! More "do nothing" basically because they don't have a clue what to do! Ever since the good old days of "Pork Barrell" vote trading ended, Congress can't get anything accomplished! Sure, votes are still "for sale" but much more diffcult to hide! Now it is all about party politics. The "Pork Barrell" had no party lines and important things actually got done! Maybe it's time to "roll out the barrell" again!!! No one is actually serious about the budget, the deficits, tax reforms (increases). In formulating his next "Team of Rivals" for his new cabinet, the President should go ahead and appoint hard line republicans to key positions to force bi-partisan support and avert more fillibuster. So to begin, the President should forget about Mr. Hagel and go ahead and appoint John McCain to the position. O' wait, I misspoke. John Mccain should be appointed to the position of White House dog walker. I'm sure Bo would approve. But Rubio drank some water!! OMG!